As strange as the echoes of old truths and a prayer. So sad to see it decaying. I’ve been looking through all the photos I’ve missed. So many many amazing glimpses of the world. Loved “Down by the River” and “One Head is Better Than Two” and “Training Wheels” and so many others. Amazing intimate moments of life. You help people to realize how much there is to see in the world and how much they may be missing. Art is all around us. And I gasped over this “Wreckage” one. This photo is so loaded. It’s one of those (that you are so good at capturing) that makes a whole bunch of emotions collide at once in me. I laughed and gasped. I also found it fascinating and eagerly wanted to explore the place — I am SO drawn to ruins of ANY kind. I love them. Looking for little signs and remnants of a life once lived there. Then I felt sad, like this was once a brand new building that probably housed some family that had a life (good or bad), but that time passes so easily and now it’s all gone. We are but a mere sigh in the breath of time. And then, (I know this may sound odd) I found it all STUNNINGLY beautiful. Just simply GORGEOUS, the lines, the decaying back into Earth, the curves and the wild “frantically” tangling weeds in front of the house. I also was hungrily curious as to who lived here once, what was there life like, were they happy or cold and angry and on and on. Wow!!! What a potent look at life, humanity, death, natural cycles, freedom, tenacity, beauty and more. 1. to leave completely and finally; forsake utterly; desert: to abandon one’s farm; to abandon a child; to abandon a sinking ship. 2. to yield (oneself) without restraint or moderation; give (oneself) over to natural impulses, usually without self-control. One of your most amazing and expressive pieces of art. Pure EXCELLENCE!! Wow. That’s crazy! It just sits there crumbling? I guess if you wait long enough, no cleanup will be needed. Made a great opportunity for a great shot, though. Nice! Wow–love it. There’s something strangely active about this photo…probably with what’s clearly the struggle (if it can be called that when discussing inanimate objects) of the house to maintain what integrity it still has…there are times when I can really relate. I love how it seems to return from the geometric to the organic again. Lines give way to curves… Excellent photo! I absolutely love this picture and the accompanying poem. So much of our crap stems from some idea we have that everything will always stay the same. We try to stave off the idea of our eventual demise this way… and in the process, we want to try and keep everything as it was. 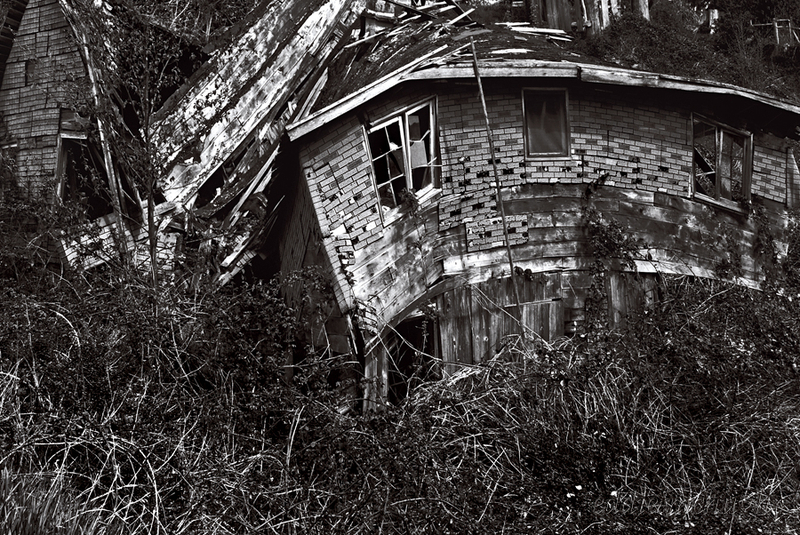 Which can never happen anyway… this house and the encroaching bushes tells this story beautifully. Often history is written by the winners of war, but now that so many people write blogs, we see the other stories, too. To me, that’s much more beautiful and rich than the ‘official line’. It has obviously seen better days, but it’s going down with very harmonious curves. I will not be very long. The processing is extremely in line with the subject. This one is really awesome and is well framed here. What impressed me is the fact that the building seems de be un-constructed, in the same sense that cubism was un-contructing perspective, this is a piec of art. What happens here? Great shot!